Once with the advent of agriculture, and its spread to Europe from the Near East, human society was transformed forever. Resources became more plentiful, communities could stay in one place and develop, and humans were free to pursue other activities. Agriculture turbo boosted the division of labor, an essential prerequisite to any civilization. Agriculture not only transformed human society, it also modified our DNA. A first of its kind study compared the DNA of ancient humans who lived between 8,500 and 2,300 years ago. The analysis revealed that humans underwent widespread genetic changes that influence height, immune system, digestion and skin colour once agriculture was introduced. 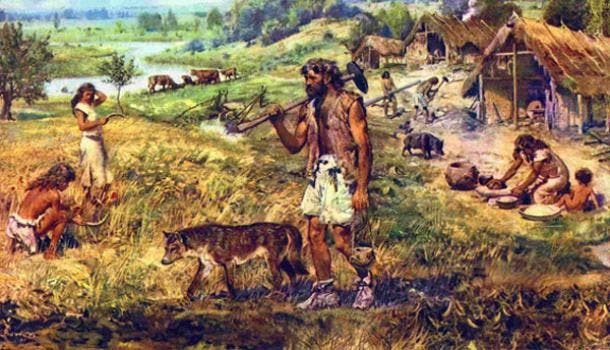 The early homo sapiens settlers in Europe were all hunter gatherers. This was the norm for over 35,000 years, until some 8,500 years ago when a massive migration of farmers started flocking into Europe from the Near East. Then, some 4,500 years, came the third major migration into Europe from the Russian steppes. These migrants were the so-called Yamnaya people, which were master horse herders. The Yamnaya also employed sophisticated technology for the time, like wheeled carriages, and knew how to tender to flocks of livestock like sheep and cattle. Incidentally, ZME Science reported last week how this third tribe may actually be comprised of two genetically distinct lineages, meaning there were four founding tribes of modern Europeans, not three like the current consensus suggests. To see what kind of changes these major migrations had on our DNA, David Reich, a geneticist at Harvard Medical School, and his colleagues sequenced the genomes of 230 people. The samples were recovered from skeleton remains collected from the entire continent of Europe. These include hunter gathers, Yamnaya, but also 21 individuals who lived in Anatolia 8,500 years ago. Anatolia or modern day Turkey is considered the stepping stone early farmers made before migrating into Europe. Reich and team came up with some very interesting results. After humans in Europe started to farm, a certain gene called SLC22A4 proved most useful. This gene encodes a protein that helps absorb more of the amino acid called ergothioneine, found in wheat and other crops. Those who had the genes had more chances to survive and pass on their genes. Previously, researchers posited that human became able to digest milk once they raised cattle. LCT, a gene that aids milk digestion, got spread out through natural selection around 4,500 years ago. It could be that raising cattle wasn’t that widespread until the Yamnaya came around the same time. Another interesting finding concerns skin colour. Hunter gathers in Europe had dark skin, the early farmers who came to Europe 8,500 years ago were lighter coloured. Later, a new gene variant emerged that lightened European skin even more. Two things might have happened. For one, the Yamnaya were light skinned, and their skin coding genes might have dominated Europe once they mixed. The Yamnaya stem from the Caucasus, which is why we call white people caucasians. Then, there’s this hypothesis concerning Vitamin D intake from sunlight. Lighter skin helps capture more Vitamin D, but somehow the hunter gathers managed to stay dark skinned. That’s because they got their Vitamin D from meat, Dr. Reich says. Once agriculture became widespread, natural selection started working in over drive again and in time the population developed a lighter tone. Maybe both hypotheses are at play. On height, the researchers found Anatolian farmers were taller than hunter gathers, and the Yamnaya taller still. Northern Europeans inherited a larger amount of Yamnaya DNA, which might explain why they’re so tall, on average. For the future, Reich and colleagues plan to analyze even more European DNA to uncover more natural selection effects. “I think in the future we can do this everywhere in the world, not just in Europe,” Dr. Reich told the NY Times. Eppie Jones of Trinity College Dublin, co- researcher on the study, said: “This paper is taking our journey back in time ever further.